After experiencing growth and preparing for the future, the company decided to move their headquarters to larger premises at Gloster House in Stockton-On-Tees. They hired the expertise of a multi-award winning interior planning consultancy to design a unique office. A key feature of their design for the lounge area was to display generation specific video content that would resonate with clients and make them feel welcome. Further to this, the Joslin Rhodes team were keen to use audio visual technology to facilitate presentations in their meeting room and they wanted to broadcast their investment training sessions online to reach a wider audience. Castle Grange were delighted to be appointed as the AV partner for this exciting project. 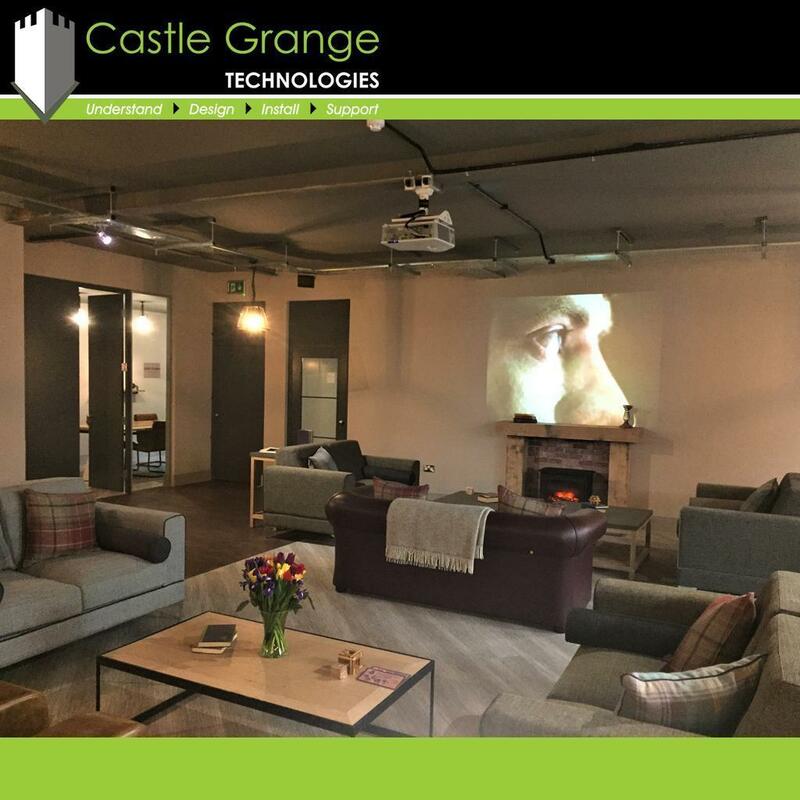 To play our role in bringing Joslin Rhodes’ creative vision to life, Castle Grange specified a solution that would allow staff members to remotely power the projector on and off, switch between sources such as ‘DVD’ and ‘Freeview’ and adjust the volume of the speakers using a touch panel. Our professional engineers implemented the installation perfectly, by securely mounting an Optoma EH515 onto the ceiling and installing four hidden speakers, an amplifier and a control system. The resulting solution provided Joslin Rhodes with an easy to use, stylish wall panel and a quality projector that delivers a clear image of the retouched video content. 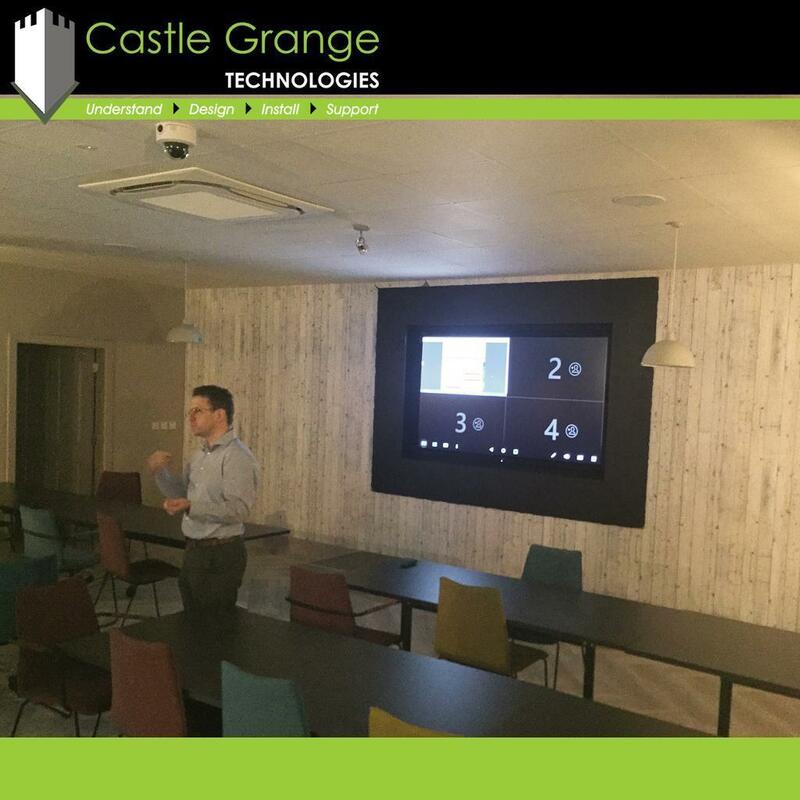 The team at Joslin Rhodes wanted the audio visual system in their meeting room to be impactful and collaborative and so Castle Grange installed an 84” CTOUCH Laser air+ with built-in android, a slot-in PC and a WePresent 2000. This system makes collaboration easy, as onlookers within the room can seamlessly share content from any device, whether that be a smart phone, tablet or laptop. We also configured a HD ceiling mounted camera with access to an online portal, which makes watching presentations back over and webcasting live sessions very simple. 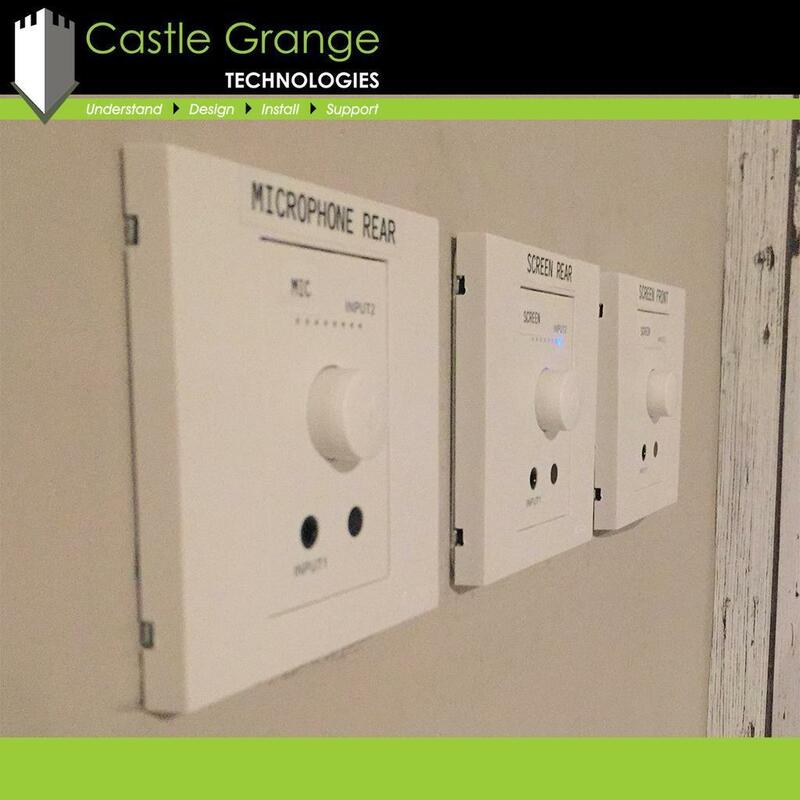 “Castle Grange did a great job, they were very knowledgeable and their engineers were efficient. “The touch panel on the wall enables us to project the right content quickly and easily in the lounge, the image is great too. The touchscreen makes an attractive focal point for the meeting room, it is ideal for delivering presentations and broadcasting live training sessions and the clever use of audio gives us a real multi-functional space! 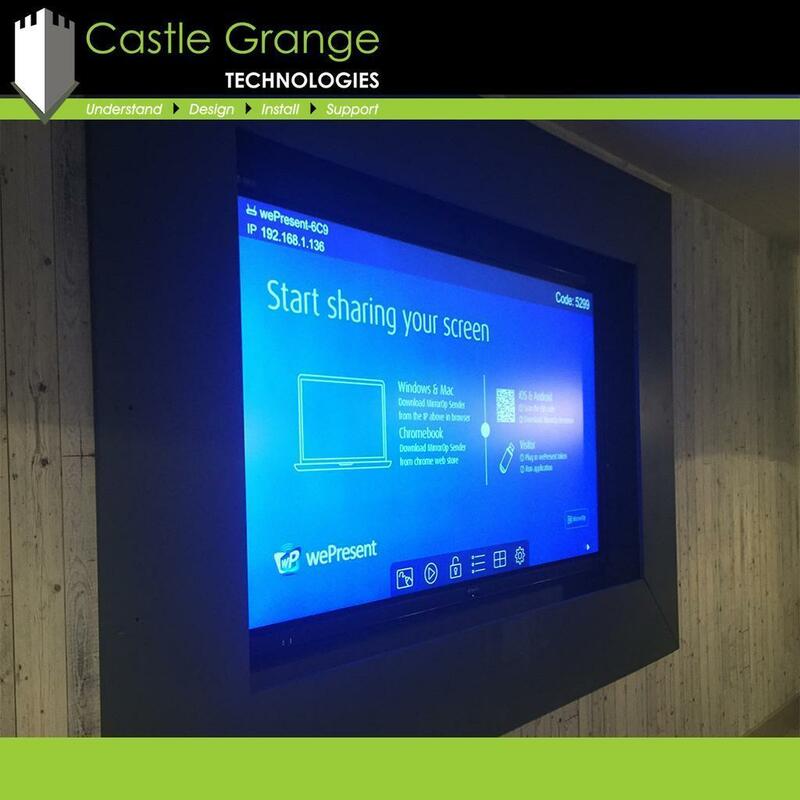 “The Castle Grange team supported and trained our staff to ensure we made the most of the technology.